After yesterday’s post about the church records in Waverly, I started entering some basic facts about Uncle Carl Rudeen and his descendants into my genealogy software (a long-overdue task). Some details about his grandson Arvid Samuelson came to light and I am in awe! Uncle Carl Rudeen and his wife Sophia had two daughters: Augusta Mathilda and Amanda Christina. As I mentioned yesterday, when the family came to America they first lived in Altona, Illinois where Carl worked for the railroad. They apparently moved to Fairfield, Iowa for a time before coming to Lancaster County, Nebraska as homesteaders in 1872. Their property was just south of the Saunders/Lancaster county line. When my great-grandparents Gust and Augusta Rudeen came to America ten years later, they came to this part of Nebraska because of Uncle Carl. Carl and Sophia were active founding members of the Bethlehem Covenant Church (originally a Swedish Mission church) in Waverly . Both of the daughters married and had children and remained in the Waverly/Lincoln area throughout their lives. I know now that Augusta Mathilda actually had three children with her first husband: Hilda, Frank and Hjalmer. Back in 1997, I was in contact with Nannie’s daughter Martha (Berquist) Burch in Texas, so I knew a little about that family (Martha has since died). I didn’t know at that time how much more there would be to learn about Arvid, who would have been a second cousin to my grandfather, Lawrence Rudeen (and thus my second cousin twice removed). Grab yourself a cup of coffee and prepare to be amazed! 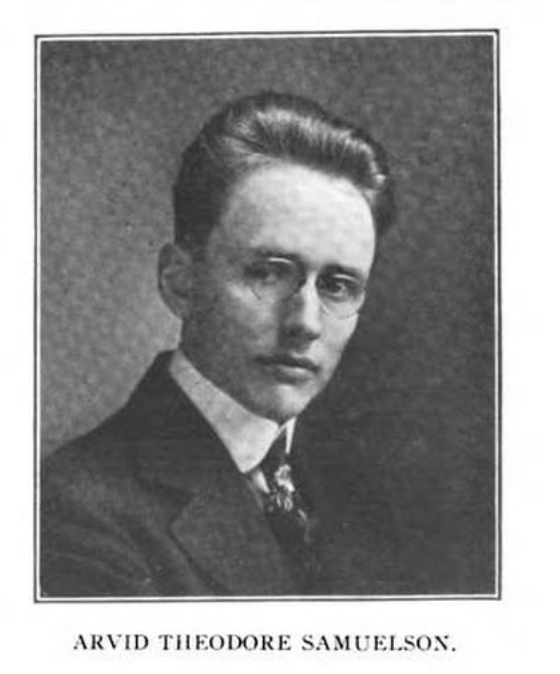 Arvid was born September 21, 1890 near Waverly. He was the first child born to Augusta and her second husband John August Samuelson. He must have attended the local one-room schoolhouse in Rock Creek Precinct. He attended the Lincoln Academy for high school and then went on to attend the University of Nebraska where he studied piano, voice and choral direction. He graduated from the University’s School of Music in 1910 and went on a concert tour across several western states in 1911-19121. 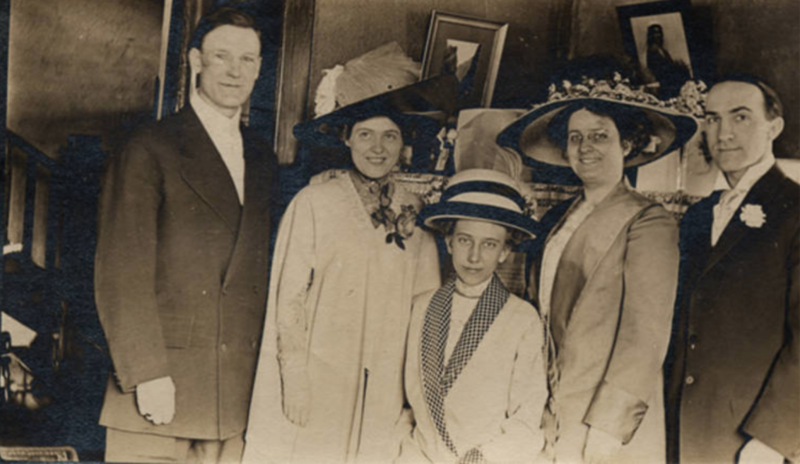 From left: Arvid Samuelson, Lillian Polley, Louise Zumwinkel, unknown woman, and H. F. Backstrom. They were no doubt posing after the Fourth Annual Concert of the Grieg Male Choir, of which Arvid was the founder and first director. The Nebraska Historical Society has a copy of the program here. Arvid was also the choir director and organist for First Covenant Church in Lincoln during this time. 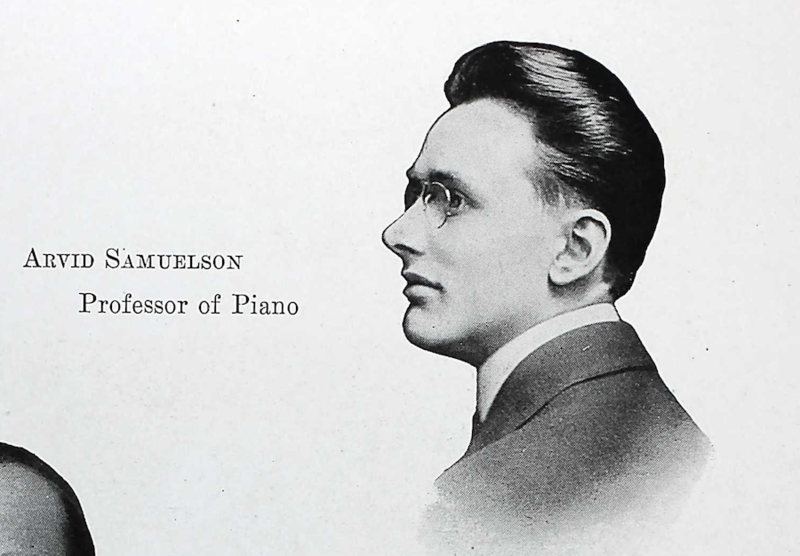 In 1915, he left Lincoln to become head of the Piano Department at the Augustana Conservatory in Rock Island, Illinois. While at Augustana, he reinvigorated the Handel Oratorio Society and started a tradition of presenting “The Messiah” every year in December. He boosted the Society membership to 300 voices and recruited the local orchestra to participate. The tradition continues to this day. In 1923, he performed the Liszt Piano Concerto No. 1 with the Tri-City Orchestra in Moline, Illinois. After thunderous applause, he played the Strauss Blue Danube Waltz as an encore3. He eventually become Director of the Conservatory. His talent was bigger than Rock Island, however. He moved to Chicago for a period of time for more advanced piano study. By 1926, he had moved with his family to New York City where he had an impressive and lengthy career as a performer, director and arranger. He continued his private piano studies, receiving instruction from mostly Julliard pianists, including Zygmunt Stojowski, Joseph Lhévinne, and Leopold Godowsky4. 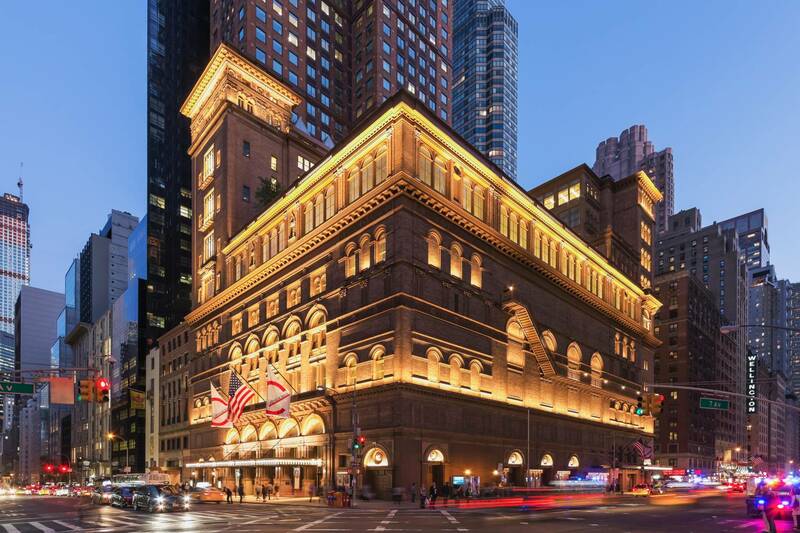 In addition to performances (principally as an accompanist to vocal performers), he established himself as a private piano instructor at Steinway Hall on 57th Avenue. He was also pianist for the Swedish Congregational Tabernacle church. It must have been amazing to be part of the music scene in New York City during the middle part of the 20th century, even if you weren’t a household name. He founded and conducted the New York A Cappella singers. The highlight of his career may have been a performance by this group at Carnegie Hall in 1947. You can see the program here; if time-travel becomes a reality, this performance will be on my itinerary, that’s for sure. If you Google his name, you will find it associated with lots of musical arrangements of choral and piano works. He seems especially popular for choral arrangements of “Bless This House” and “Jingle Bells” which are still performed today (see videos at bottom of post). Arvid died at age 74 at his home in New Jersey in 1964. I don’t know what became of his wife and children; I believe he had at least four daughters. It seems that Nebraska was never very far from his heart; he lies buried in the Bethlehem Church cemetery in Waverly under a simple tombstone.